- Section of bronchiole of no cartilage. - The relation between pulmonary alveoli & terminal bronchiole. - Made of PVC plastic and mounted on plastic base. 2. The relation between pulmonary alveoli terminal bronchiole. 2. The relation between pulmonary alveoli & terminal bronchiole. Made of PVC plastic and mounted on base. 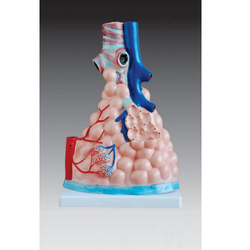 he model shows the small branches of principal bronchus:1. Section of bronchiole of no cartilage.2. The relation between pulmonary alveoli and terminal bronchiole.3. The structure of alveolar sac and alveolar duct.4. 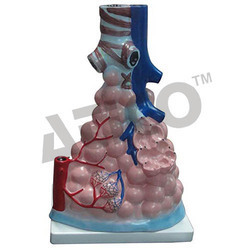 The capillary rete in the alveolar sapta.Made of PVC plastic and mounted on plastic base. Size: 26x15x35CM. This model is designed as an aid to the teaching of anatomy of female pelvis in middle institutes. It facilitates the students or clinical workers to get an integral knowledge of various important structures, such as pelvic muscles and pelvic organs as a whole. - The relation between pulmonary alveoli and terminal bronchiole. - This model is made of plastic. 4. The capillary rete in the alveolar sapta. Made of PVC plastic and mounted on plastic base.